Trademarks are a brewery’s public face to its customers and the marketplace, and the goodwill protected by trademarks can be one of its most important assets. The best way to protect that value is to register trademarks with the United States Patent and Trademark Office (USPTO). By understanding tactics and strategies that are effective before the USPTO, you can maximize the opportunity to obtain full Federal protection for your brands. Trademarks cover names, logos, brands, or other identifications of the source of goods and services. An example trademark is the name Sierra Nevada®. The holder of a trademark has the right to stop anyone from using a confusingly similar name, logo, or other brand for similar goods or services. For example, if someone wanted to start a brewpub with the name Sienna Nevarda, the name “Sienna Nevarda” would likely be too similar to Sierra Nevada® to gain a trademark registration. But if Sienna Nevarda, or even Sierra Nevada, were a trucking company, then the USPTO might grant a trademark registration because, while the name is similar, the businesses are different and may not cause confusion in the marketplace. A trademark may last into perpetuity as long as the owner of the mark continues to use the mark in connection with the goods and services, although the trademark registration is subject to periodic renewal. 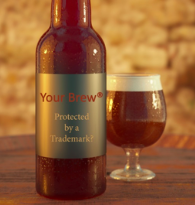 A simple trademark application may be filed without professional assistance using forms on the USPTO website, but depending on the trademark complexity, value to your brewery, and your capacity to spend the time necessary to properly submit a trademark application, a professional trademark attorney may be sought. A trademark application must specify the trademark sought to be registered and the goods or services with which the mark is used or is to be used. The specified mark can be a word or phrase in standard character form, meaning that any use of the mark will be covered regardless of font or added design elements (e.g., a logo’s graphics). Alternatively, the specified mark can be a design, with or without words, and can even be a sound, such as a television network’s chime, or a color, such as pink for insulation in the case of Owens Corning. When selecting a trademark, it is best to choose one that is sufficiently different from other marks associated with similar products or services. The Trademark Office provides an interface on its website (uspto.gov) for searching already-registered marks. A trademark should also be distinctive in relation to the goods or services. For example, the Trademark Office will reject a trademark for “Cerveza” (Spanish for beer) if it is to be used in conjunction with selling beer but has registered the term in a distinctive combination with other terms, even with respect to beer. The specified goods or services can be broadly listed (e.g., “beer”). The Trademark Office has divided various types of goods and services into 45 classes, but these classes typically have no effect on a trademark application other than cost. If an application is to cover goods or services that are in two different classes, the government filing fee, as well as many other fees, for the application will be twice as much. A trademark application covering beer falls under one class, class 32. In addition, the application must be filed in the name of the entity that is or will be using the trademark. For example, a brewery’s trademark must be filed in the name of the brewery, not the president or owner. Filing in the name of the wrong entity will result in an invalid trademark application, leaving any resulting registration vulnerable to cancellation. The application process begins with preparing and filing a trademark application. There are two basic types of trademark applications: use-based and intent-to-use. The Trademark Office will only issue registered trademarks to those who actually use a mark in connection with specified goods or services. An applicant has the option of filing an intent-to-use application, which means that the applicant has not yet actually used the subject mark in connection with goods or services, but has a bona fide intent to use the mark. The application will be examined similarly to a use-based application, but if the application is allowed, the mark will not become registered until the applicant shows that the mark is in use. Once filed, an application will experience a period of pendency before it is first examined. That time is typically three to four months. Once examined, if not rejected for one or more issues, the application will be scheduled to publish for its 30-day opposition period. If not opposed, a use-based application will be put in line for registration, which will issue a number of weeks later. If the application is an intent-to-use application, the applicant will need to show uses of the mark before being put in the registration queue. In all, if the examiner does not raise any issues during examination, the time from application filing to registration is usually about eight to ten months for a use-based application. During examination, however, a trademark application may be rejected on a number of grounds (e.g., likely confusion with an already-registered mark). The applicant will have an opportunity to respond to the rejections, and if they are not resolved, the applicant can appeal. During the 30-day opposition period, any party who believes that it will be harmed by registration of the trademark can oppose the application. An opposition is a proceeding before the Trademark Trial and Appeal Board that is similar to a lawsuit in Federal court. Trademark registrations must be renewed every ten years. For each renewal, the owner must show that it is still using the mark for the specified goods or services and must pay a renewal fee. In addition to renewal every ten years, new registrations are subject to the requirement that the owner show use between the fifth and sixth anniversaries, as well as pay a fee. At this time, the owner may also claim that the registration has become incontestable through substantially exclusive and continuous use for five years. If a registration is not renewed it will become cancelled. If cancelled, there is no mechanism for reviving the registration; the only solution is to re-file the application. But such a re-filed application might not be successful, so it is important to keep track of renewal deadlines. The USPTO has recently been sending reminders for renewals, but has not always done so and is not required to do so. If an attorney handles your trademark application, the attorney can keep track of such deadlines in his docket to send reminders. When properly planned, trademark applications can be a relatively inexpensive, but important, part of an intellectual property strategy for your brewery, providing valuable coverage for your brands and marketing. Patrick Quinlan is a patent and trademark attorney with a Buffalo office of Hamilton, Brook, Smith & Reynolds, P.C., Concord and Boston, Massachusetts. Patrick is a home brewer and speaks on the topic of protecting your brewery through trademarks and patents. When he is not brewing himself, he can be reached at his office at paq@hbsr.com and 617-607-5918.